Growing up, football was never my sport. Basketball, soccer, and rock climbing all dominated my attention far more than the ironically named football, in which only a handful of players ever make contact with the ball using their feet. Two reasons explain my early lack of enthusiasm. First, I am female, and as such never played organized football. Credit middle school gym class for finally teaching me the rules; I got good enough to captain some neighborhood two-hand touch with the boys. But football remains one of the only sports women are still not encouraged to play. (Unless you count hockey, which I don’t, because where are we, Canada?) You want to play basketball? Great. Soccer? Awesome. Lacrosse? Okay, but we’re going to make you wear mouth guards and goggles and it’s illegal to hit each other. Football? Awkward silence. I bring up my lack of experience playing the game because this directly impacts my ability to enjoy watching it. You can’t really get excited about something you don’t understand, and the best way to learn is by doing. My second reason for not caring was not really having a team to invest in. By middle school this changed, as my town’s high school was in the midst of a three-peat as state champions. I went to the games with my dad and generally understood the basics of what our team was trying to do and how important it was that they do it. While it was impossible to avoid getting caught up in the excitement of a live game, watching football on TV still held little appeal. The only exceptions were Virginia Tech games, for which the entire region of Southwest Virginia pretty much shuts down. So I watched with my friends and family over cookies and bean dip. It was fun to cheer for Tech to win because they often did. These were the days of Marcus Vick, and later Tyrod Taylor. But I could never even approximate the level of absolute hysteria known only to true VT fans, whose blood runs that tacky maroon and orange. I became a wahoo just in time for some seriously not-so-great years of UVA football. This ushered in another tradition – cheering (praying?) for UVA as they inevitably lost to Tech. The Hokies have their standard deck of insults. They usually start “The last time UVA beat Tech” and end something like “there was no such thing as an iphone” or “George W. Bush was pretty popular.” To this humiliation, Cavaliers respond with our standard pack of excuses, usually beginning “Oh yeah, well UVA is still better than Tech in…” followed by things like lacrosse, soccer, and the Founding Fathers. If I hadn’t quite been there in high school, I was hooked on college football. The NFL had to wait for my attention. This would have been different if I lived in a major city like Philadelphia or Denver, but Virginia just doesn’t have an NFL team. I know some Virginians are big Redskins fans (can we still say Redskins? ), but I don’t see how a team four hours away and not even in this region should command my respect more than anything else coming out of Washington these days. So I waited for players like Bret Favre and Peyton Manning to get me to care about the NFL. I now like to watch on Sundays, especially as it gets colder – not out of any deep loyalty to a particular team, but for the chance to see the best players compete and entertain, often while grading papers and doing laundry. When it comes to watching professional sports on TV, I have always preferred basketball. In football, there are too many players, the positions are confusing, and you can’t see their faces. Basketball has none of these impediments. Twelve man team, five starters. Two guards, two forwards, a center, and they all play offense and defense. You can definitely see their faces, expressions, crazy hair, and tattoos. No nameless legions of anonymous helmets in skin-tight pants here (which from a female standpoint are preferable to baggy shorts, so score one for football!). 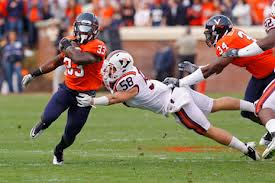 But even as I salivate over the thought of seeing Derrick Rose back in action for the new and improved Chicago Bulls and Lebron James return to the suddenly serious Cleveland Cavaliers, I have to admit I am getting super excited for college football season!!!!!!! People hit each other, repeatedly. In baseball and soccer, this happens incidentally; in tennis and volleyball not at all. Basketball players may push each other around in the paint, but they don’t bring each other to the ground dozens of times in a single night. There may be a high degree of grace and agility demanded of certain positions, but a lot of the action comes down to brute force, or for the scientifically inclined, mass times acceleration. Yes, football teams have lots of players. Armies have lots of soldiers – so many that a chain of command is required to coordinate the mission. This even includes reconnaissance from above – the people up in the skybox sending intelligence down to the generals on the ground. Each position has a coach. The offense and defense have coaches. Head coaches are revered as something approaching saints. That is, until they call a really stupid play and lose the game. Those helmets and plethora of pads I can’t even name? Every soldier needs his armor. You can’t see their faces, and you might not even know your entire team’s roster, but soldiers are not meant to be showered with individual glory. Everyone does their particular job to make the whole team work. They might not all be glamorous, but they are all necessary. Each game is a big game – a battle – because there are not too many. Seriously, basketball, you should really learn from this. 82 games are too many games. Having to wait until Saturday (or if you’re lucky, Thursday night) allows time for the anticipation to build. But the best part of football has to be the rivalries, the best of which exist at the college level. In order to be true rivals, you have to hate each other almost like the French and Germans did in the World Wars, or the Greeks and the Turks. Mild dislike will not suffice. Last night I watched a couple of documentaries on ESPNU (Hey, life is hard in the NBA off-season.). 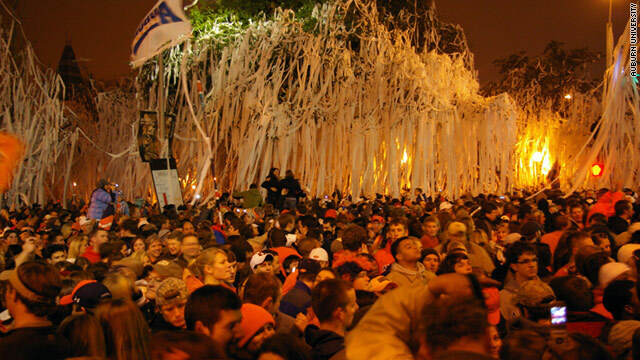 One was about the rivalry between Auburn and Alabama, War Eagles versus Roll Tide. Alabamians repeatedly said that you can’t understand the intensity of the rivalry unless you had lived it, but this film gave a pretty good sense. A loss for one side leads to 364 days of depression, a win 364 days of joy. Everything is riding on the outcome. Married couples on opposite sides of the rivalry can’t watch the game together. One Alabama fan went so far as to poison Auburn’s live oaks, earning more scorn than if he had killed an actual person. The Alabama-Auburn rivalry surpasses the Virginia-Virginia Tech rivalry because both sides care so much, and both sides are consistently so good. So here’s to the battles – the heroes, the villains. Here’s to the best kind of war – the kind where glory is the prize, but not at the cost of actual lives. Here’s to a fall filled with passion and intensity, even the vicarious sort that comes from observing the rivalries of others. Here’s to the sacks, the completions, the 98-yard returns for touchdowns, and the fourth quarter comebacks. That’s enough to inspire even a lifelong hoops fan.